Although I’m often dissatisfied with the distinction between philosophy and theology, and precisely where the line is drawn, I realise that there is a proper distinction between the disciplines. You wouldn’t expect to sit down in a systematic theology class and hear a lecture on the B theory of time (even if God got a mention), in spite of the fact that some ideas in theology (for example, foreknowledge) might involve presuppositions about time. Similarly it’s unlikely that you’ll hear a lecture on the doctrine of the inspiration of Scripture in a course on philosophy of language, even though the doctrine of the inspiration of Scripture may at times make assumptions about language use. This is just one reason why I think a well rounded education in theology ought to have a philosophical component (and similarly, I think that anyone wanting to study philosophy of religion or to look at the religious implication of other areas of philosophy really needs to invest time studying theology). 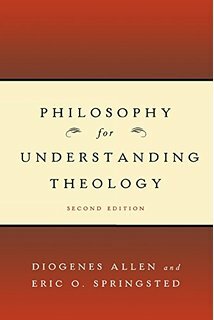 To serve this end, I want to recommend with utmost enthusiasm this book, Philosophy for Understanding Theology by Diogenes Allen with Eric Springstead (Louisville: Westminster John Knox Press, 2007, second edition), paperback, 267 pages. I finished reading the book quite some months ago now and I’ve been meaning to recommend it to my readers. The book is a sweeping historical introduction to the major schools of thought in philosophy (primarily metaphysics and epistemology) that have a bearing on the study of theology. A real strength of the book is that it doesn’t try to make the theologian a philosopher. The authors don’t try to cover everything in philosophy (an impossible task!). Instead, the key ideas that inform theological issues are unpacked throughout their historical development, and the reader comes away with a brilliant introduction to philosophical worldviews that are responsible, directly or not, for issues in theology. For example, if you bought the book for no other reason, the explanation of classical metaphysics and the basis of categories is simply outstanding – without a doubt the best overview I have come across anywhere. The relationship between Aristotle and medieval scholasticism is covered, as is the scientific revolution and the rationalism / empiricism divide. In order to be a good theologian, all of this is material that you simply need to be familiar with, and here it is presented with great clarity and succinctness. To be perfectly honest, the later chapters on existentialism and postmodernism lacked the ability to hold my attention that the rest of the book did, but I don’t blame the authors. What can I say – existentialism and postmodernism just don’t do it for me. If I teach a course on systematic theology there’s no doubt that this book will be high on my recommended reading list, and if your interest is in theology but you don’t have an undergrad background in the history of theology, metaphysics or epistemology, you should definitely give this one the time to read. Even if you’re just someone who reads the history of ideas for pleasure, you’ll get plenty of pleasure here. See – they’ve sold out! That’s how good it is. Oh well, you might have to settle for Amazon. Talking about books – why don’t you buy Glenn a book for his birthday this Sunday? Great book! It helped me so much as a philosophy major understanding the relationship between the two.